La composition de psaumes et motets traverse toutes les périodes de création de Telemann. Son oeuvre comprend aussi bien des grandes oeuvres pour solistes, choeur et orchestre que de plus petites formations, qui ne prévoient qu’un continuo en accompagnement des voix. Ce CD présente, à côté de la Musique funèbre hambourgeoise, purement instrumentale, un choix d’oeuvre vocale aux fonctions diverses : la mise en musique du psaume „Ich danke dem Herrn von ganzem Herzen“, à l’instrumentation colorée, le motet „Es segne uns Gott“, accompagné par un simple continuo, le motet pour double choeur „Halt, was du hast“, ainsi que le motet sur choral à quatre voix „Ein feste Burg ist unser Gott“, ou encore le psaume 96 „ Singet dem Herrn ein neues Lied“, accompagnée par un ensemble à cordes. L’ensemble vocal de Rastatt et l’orchestre baroque Les Favorites dirigés par Holger Speck brillent par leur interprétation vivante et affirmée. [...] The disc's title work is a substantial motet (10 and a half minutes) based on the famous Luther hymn--and, in a style reminiscent of many of Bach's chorale treatments, the tune runs in ingeniously varied ways through each of the five verses. It's the disc's highlight, both in terms of the sophistication and continuously appealing musical details and for the full-bodied, vibrant choral singing (the sopranos resplendent and the choir perfectly balanced with the instruments). Telemann's psalm setting Singet dem Herrn (a different psalm text from Bach's similarly titled masterpiece for double chorus) is another extended work--nine movements employing solos, duets, and choruses--likely written relatively early in Telemann's career, yet it shows skillful organization, nicely compact sections, interesting choral writing, and artful integration of orchestral instruments. Perhaps the most pleasant surprise here is the group of instrumental selections--"movements from festive music Telemann composed for funerals of two Hamburg mayors"--that occupy the middle portion of the program. This is some of the most mellifluous, tuneful, and rhythmically fluent music you'll hear outside of Handel--and Telemann's particular use of trumpets, trombones, and winds brings an extraordinarily rich color (unlike anything you'll find in Bach) to these grand yet reverent scores (the sound of the "muffled" timpani, whose purpose is explained in the notes, is just right). The baroque orchestra Les Favorites, founded only a couple of years ago, is a really fine ensemble, and it's well-led by Holger Speck, who keeps tempos flowing smoothly and articulation clear and crisp. All of the solo singers are expert, the choir is marvelous, and the sound, from a Karlsruhe church, complements voices and instruments with ample space,natural timbres, and careful balances. What else need be said, except "More Telemann!" Das Vocalensemble Rastatt und das Ensemble Les Favourites unter der Leitung von Holger Speck stellen in ihrer jüngsten Einspielung eine Auswahl verschiedener geistlicher Vokalkompositionen Telemanns vor ... Neben den Psalmvertonungen und den Motetten steht eine Instrumentalkomposition Telemanns im Zentrum der CD. Les Favourites ist ein exquisites Ensemble, das zumeist projektgebunden arbeitet und mit der Konzertmeisterin Veronika Skuplik vor allem renommierte Bläsersolisten wie Reinhold Friedrich, Edward Tarr oder Martin Stadler einbinden konnte. ... Das Vocalensemble Rastatt und Les Favourites unter der Leitung von Holger Speck haben mit dieser Telemann-Einspielung ihre 4. CD bei Carus herausgebracht. Holger Speck gehört zu den erfolgreichen Nachwuchsdirigenten in der Chorszene und ist Dozent an der Staatlichen Musikhochschule in Karlsruhe. Seine Arbeit wurde geprägt durch seine 10-jährige Zugehörigkeit zum Stuttgarter Kammerchor unter Frieder Bernius. Preise bei Deutschen und Internationalen Chorwettbewerben bezeugen den Erfolg des Vocalensemble Rastatt, das sich durch einen außerordentlich homogenen Klang und perfekte Textdeklamation auszeichnet, wobei das Ideal des Wohlklanges vor der dramatischen Ausdeutung zu liegen scheint. (Stä) Nach einer schönen Buxtehude-CD unternehmen das Vocalensemble Rastatt und sein Leiter Holger Speck den zweiten diskografischen Schritt in Richtung Barockmusik. Die jüngste Produktion - erneut vom Stuttgarter Schatzgräber-Label Carus veröffentlicht - widmet sich dem Schaffen von Georg Philipp Telemann und enthält fünf geistliche Vokalwerke (sowie ein Instrumentalstück), die eine große Bandbreite in der Besetzung abdecken. Sie zeigen einerseits das meisterliche handwerkliche Niveau des Komponisten, lassen aber andererseits auch ein durchaus schwankendes Inspirationsniveau erkennen. Während etwa die Motette Halt, was du hast zu einer beglückenden Mischung aus polyfoner Kunstfertigkeit und expressiver Schlichtheit findet, geht das titelgebende Werk Ein feste Burg mitunter doch etwas penetrant mit seinem Cantus firmus hausieren. Die Interpreten trifft dabei keine Schuld: Das vorzügliche Kammerorchester Les Favorites artikuliert ungemein lebendig und sprechend - also im besten Sinne historisch - und verschmilzt mit dem schlank singenden Chor zu einer homogenen Einheit, aus der nur gelegentlich die eine oder andere nicht ganz einheitliche Vokalfärbung herausfällt. Die überzeugende Solistenriege rundet die Aufnahme zu einer klangschönen Wiederbelebung des immer noch etwas stiefmütterlich geliebten Komponisten. 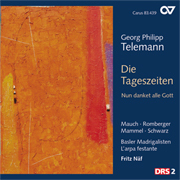 With a composer as prolific as Telemann and with an oeuvre covering so many different styles and genres, it must be difficult to make a selection of his works for CD. 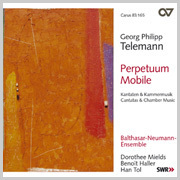 For this latest disc in the Telemann series, German music publishers Carus have issued an attractive selection of Telemanns motets and psalms based on Biblical texts. The two substantial Psalm settings, Ich danke dem Herrn von ganzem Herzen, TVWV 7:14 (setting Psalm 111) and Singet dem Herr ein neues Lied TVWV 7:30 (setting Psalm 96) survive in manuscripts which give little clue to the works dates. The Psalm 111 setting is attractive, scored for choir and soloists with an accompanying ensemble of trumpet, oboes and strings. The result is imaginatively scored by Telemann and alternates solos for each of the soloists (soprano Ruth Ziesak, alto Arnon Zlotnik, tenor Jan Kobow and bass Konstantin Wolf) with choral movements. The Psalm 96 setting is probably an early work. Though the manuscript comes from a collection in Frankfurt-am-Main, the work probably pre-dates Telemanns period as Musikdirektor in Frankfurt (1712  1721). Written for choir, soloists and string accompaniment, it opens with a short, lively instrumental sonata. Attractive duets for alto Arnon Zlotnik and tenor Michael Berner and for soprano Sonja Erwide, alternate with choruses and solos for alto Arnon Zlotnik and bass Konstantin Wolf. The other substantial work here is the Hamburgischer Trauermusik. This dates from Telemanns later, Hamburg period and consists of instrumental music which he wrote for the funerals of two Mayors of Hamburg. Part 1 was written for a funeral in 1723 and part 2 in 1739. Written for an ensemble consisting of 2 oboes, 3 trumpets, timpani and strings, the resulting suite displays some of the most sophisticated music on the disc. 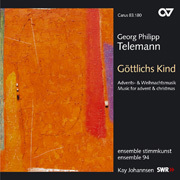 Telemanns use of muted trumpets and muffled timpani imparts a muted, funereal air but the music is richly orchestrated, full of wonderful felicities and deep-toned orchestral colours. The disc is completed by three motets from the library of Princess Anna Amalia, sister of Frederick the Great of Prussia. They are very traditional in style, with just continuo accompaniment. Halt, was du Hast, TVWV 8.9 follows the structure of the traditional 17th century Lutheran chorale motet with the chorale melody O du allersüsseste Freude used as a cantus firmus in the third section. Es segne uns Gott, TVWV 8:8, is a short piece; a late composition notable mainly for its use of German expression markings, something Telemann started doing after 1730. 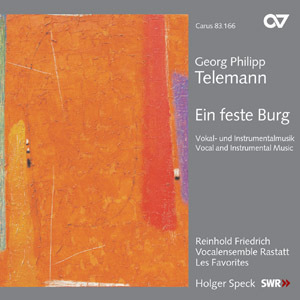 Ein feste Burg, TVWV 8:7 was written whilst he was musical director in Hamburg (1721  1767). Written for the celebrations in 1730 of the bicentenary of the Confession of Augsburg, it sets five verses of Luthers well known hymn. All these are given attractive performances by soli, choir and orchestral ensemble. The choir, Vocalensemble Rastatt (numbering around two dozen singers), makes an admirably crisp sound and their German diction seems to be good; something which is important in these works written in the vernacular for popular edification. They are accompanied by the instrumental ensemble, Les Favourites, who respond in an admirably crisp and flexible manner to Holger Specks direction. 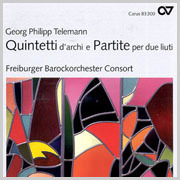 In the purely instrumental pieces they display real enjoyment of Telemanns lovely orchestration. The soloists are all admirable, singing with style and a fine sense of line. A particular mention must be made of the hard working alto, Arnon Zlotnik, and bass Konstantin Wolff, who both sing solo on four tracks a-piece whereas the other soloists perform on just one track each. This is an attractive disc, with a well put together and varied programme played in fine style by performers who convey real enjoyment. It would make an admirable introduction to Telemanns art.